#8 – Explore the Countryside | Why Run? 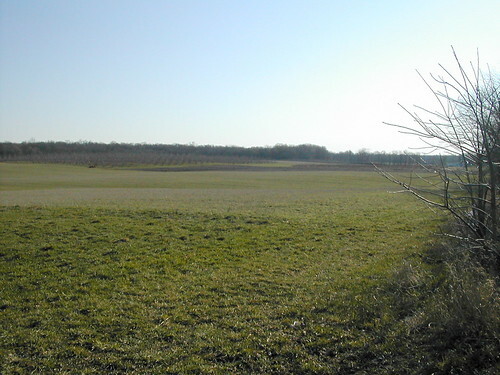 Today I went for my weekend long run, choosing to explore some of the rural farmland here in west Michigan. I left home right at sunrise and the clear skies provided stunning views. Lots of wildlife crossed my path – deer, vultures, hawks, blackbirds, sparrows – but none were cooperative enough to pose for a photo. Fortunately the countryside itself doesn’t move nearly so quickly! 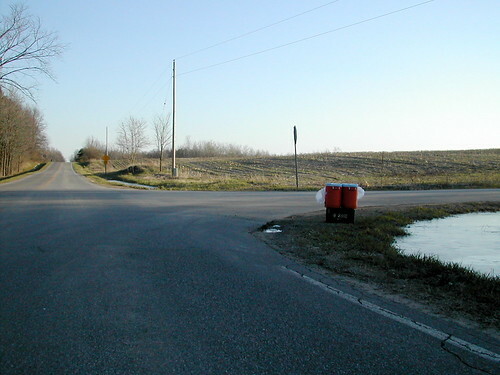 Out in the middle of nowhere I was surprised to come across a stash of water and Gatorade! Scribbled on the lid was “rungazelle.com“, a running club based out of the local running store Gazelle Sports. I figured they must be out for an organized training run. Since I had three liters of water on my back to use up, I didn’t touch their stuff… besides, I didn’t ask permission! 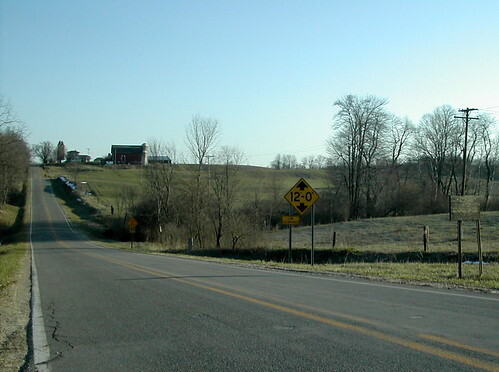 A couple miles later I was in the middle of some big, rolling hills when I spotted this picturesque farm. As I got closer I saw a sign proclaiming this farm to be 164 years old, having stayed in the same family since 1873! Pretty amazing. It’s such a great location that I’d want to keep it, too. 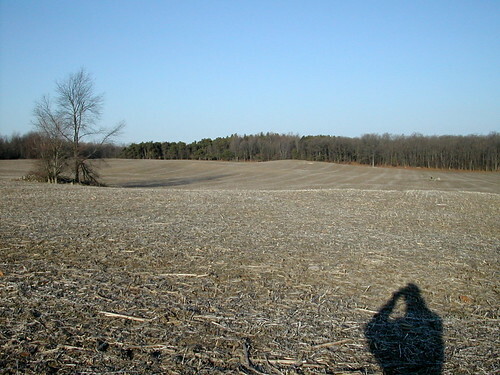 Across the street from the farmhouse was this view that that family has awakened to for the past 164 years. Yes, that’s my shadow in the low, morning sun. 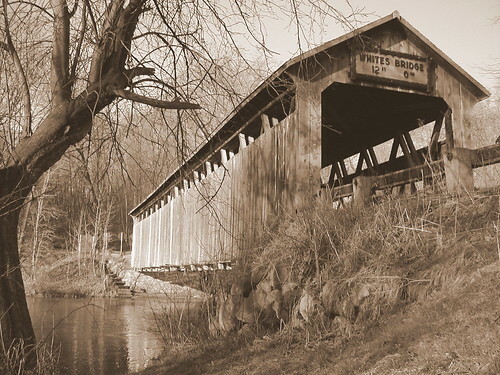 Leaving the farm and descending a steep hill down into the Flat River valley, I crossed one of Michigan’s historic covered bridges, White’s Bridge. 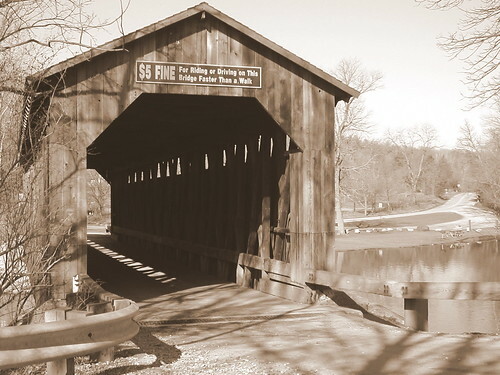 There’s just something really charming about these bridges, don’t you think? 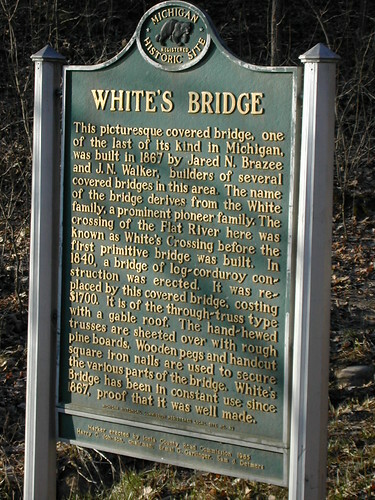 The Michigan Historic Site marker describing White’s Bridge. Climbing north from White’s Bridge out of the valley I was treated to this spectacular view of the Flat River. This is one of the prettiest views you’ll ever see (sorry, the into-the-sun photo doesn’t do it justice) and it’s visible from a simple isolated stretch of dirt road. Continuing along the dirt road I passed by this interesting silo that has been converted into what looks kinda like a lighthouse. You can’t tell from this angle, but this silo is sitting on the bluff overlooking that stunning section of Flat River seen in the previous photo. 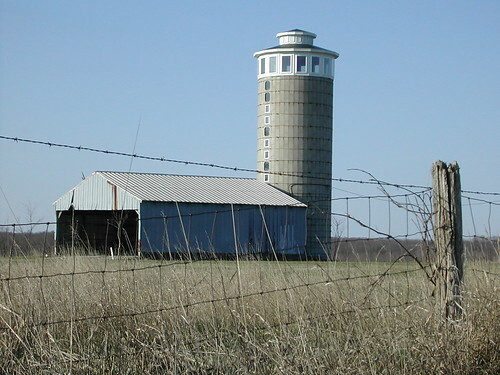 If I ever own a silo someday, it would be this one. 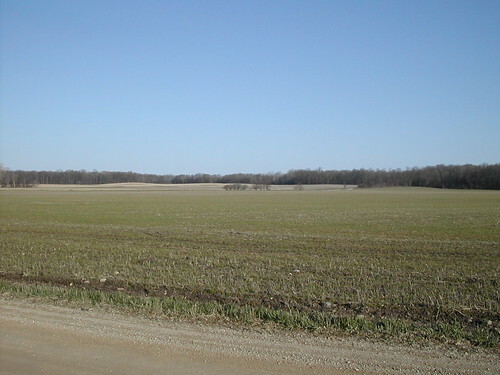 Turning around, this is what I saw across the road from the silo – a flat, wide-open field. It’s amazing how the Flat River carved such a deep valley just a few hundred feet behind me yet left this stretch of land flat as a pancake. I ran past cornfields, beanfields, hayfields, wheatfields, but my trek wouldn’t be complete without passing a Michigan apple orchard. Maybe I’m partial to them because my dad grew up farming apples, but I think they’re more picturesque than any other farm crop. 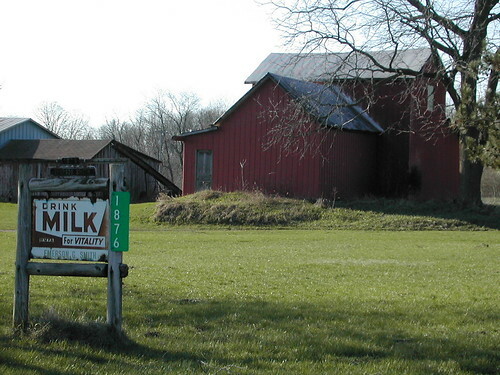 Speaking of farm “crops”, Michigan has its share of dairy farms, too. 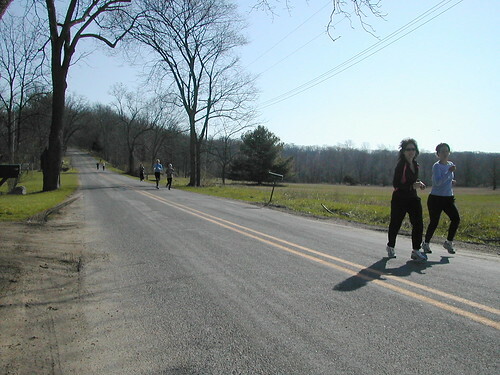 The sign says “Drink Milk for Vitality” and a glass of cold milk sure sounded good right about then – I was two and a half hours into my run at this point. 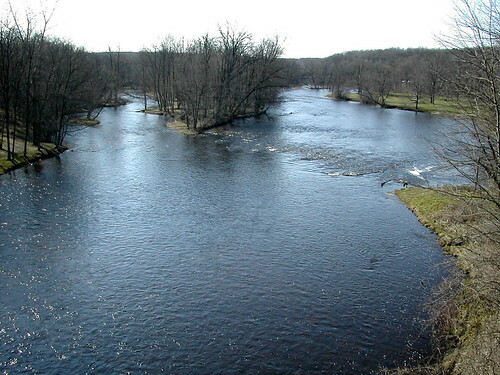 Here I am at the Flat River yet again, but several miles south of White’s Bridge now. 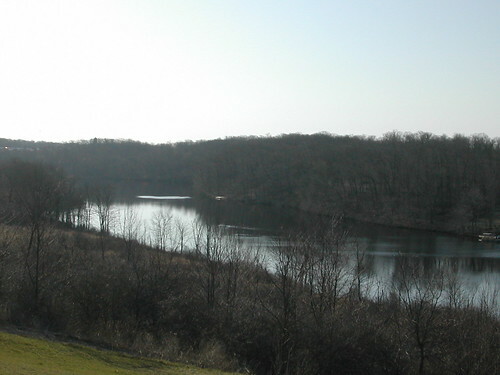 This photo was taken from a modern vehicle bridge at the north end of Fallasburg Park in Lowell, Michigan. The North Country Trail has an access point just to the left of the photo’s field of view, but since I ran there last week I kept to the roads this time through. 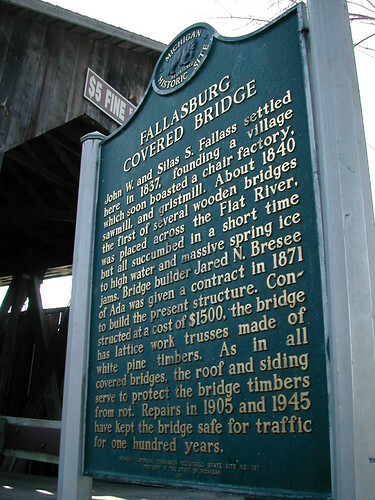 This historical marker describing the Fallasburg Bridge. 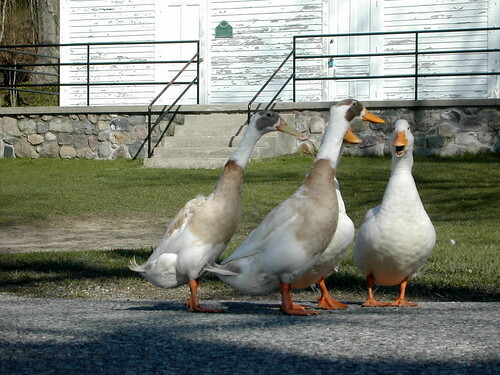 Running up the hill away from the Fallasburg Bridge these four ducks crossed the road ahead of me. As I crouched down to get a duck’s-eye view, they started waddling towards me! It looks like the one on the right is the drill sergeant, quacking orders to the others to ensure they look good for the picture. Moving just tad more quickly than those ducks were the RunGazelle folks nearing the end of their group run; about an hour earlier I had passed them up near that apple orchard, so I figure they were running about 1.5-2 hours. At this point I was three hours along but just as close to finishing as they were. After taking that photo I ran less than five minutes before meeting Amanda, who was out for a long walk of her own. We walked the North Country Trail back to where she’d parked the car and headed home. Check out her blog, too, for some photos she took on her trek. Where do you usually run? In town, near your home? That’s true for me – I walk out the front door with running shoes on and most of my runs don’t go far enough to take me into the countryside, but today’s 16 miler gave me the opportunity to bring the camera and see some new sights. Next time you’re up for a long run, I suggest you head “outward”, away from town, even if you have to drive a bit to get closer to the countryside. And don’t forget your pocket camera!